After setting the box office on fire last weekend, Marvel's Thor: Ragnarok goes up against two newcomers, 20th Century Fox's adaptation of Murder on the Orient Express and Paramount's comedy sequel Daddy's Home 2. After a horrendous month of October at the box office, Thor: Ragnarok provided a much needed jolt with an impressive $122.7 million box office opening weekend, although these two newcomers aren't expected to put up anywhere near the opening weekend that this Thor sequel did. 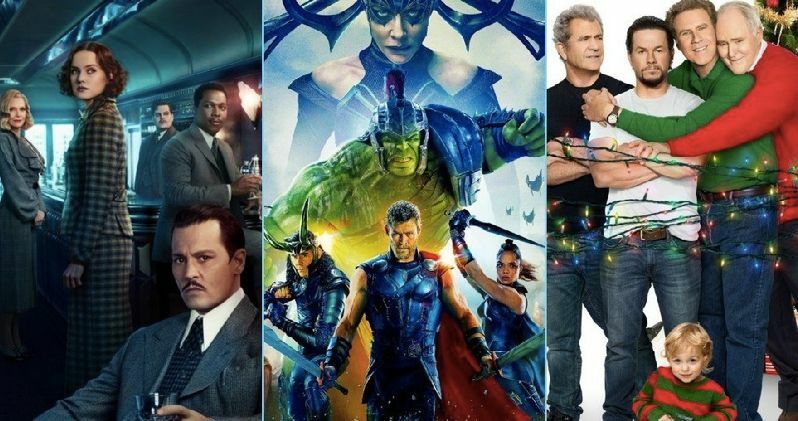 Thor: Ragnarok is expected to come out on top once again with a projected $65.2 million, more than enough to best Murder on the Orient Express and Daddy's Home 2. If this Thor sequel hits this projection, it will represent a modest 53% drop from its massive opening weekend. Even with the glowing reviews that Thor: Ragnarok has gotten, with its 93% Rotten Tomatoes rating the second highest in MCU history behind 2008's Iron Man (94%), it's still expected to drop roughly 50% from its massive debut. In fact, if it does hit this projection and drops 53%, it will be a lower second-weekend drop than the first two MCU movies to hit theaters this year, Guardians of the Galaxy Vol. 2 (55.5%) and Spider-Man: Homecoming (62.2%), both of which went on to earn more than $300 million domestic this summer. As for the two newcomers, we're projecting that Murder on the Orient Express will take second place with a projected $28.7 million, with Daddy's Home 2 not too far behind with $25.2 million. Both movies are expected to open in roughly 3,300 theaters, and while there aren't enough reviews on Rotten Tomatoes for Daddy's Home 2 yet, Murder on the Orient Express currently has a 67% rating on RT. Still, critical approval is often not necessary for box office success, and one only has to look towards the first Daddy's Home for proof of that. The original comedy starring Will Ferrell and Mark Wahlberg only scored a paltry 31% with critics, but became one of the surprise hits of 2015. Despite opening on Christmas Day, just a week after the record-breaking box office success of Star Wars: The Force Awakens, Daddy's Home still managed to pull in $38.7 million in its opening weekend, dwarfed by the massive $149.2 million second weekend of Star Wars: The Force Awakens, but still quite impressive nonetheless. This was also in a weekend where Concussion, Joy and Point Break all opened on Christmas Day as well, but none of which failed to come even close to Daddy's Home. The original comedy earned $150.3 million domestic and $242.7 million worldwide, which lead to the sequel being greenlit. This follow-up brings in the fathers of Brad (Will Ferrell) and Dusty (Mark Wahlberg), played by Mel Gibson and John Lithgow. Murder on the Orient Express features an all-star cast that is lead by director Kenneth Branagh, who plays Detective Hercule Poirot. After a murder is discovered aboard the Orient Express during a lavish trip through Europe, the trip quickly turns into a race against time to solve a murder aboard a train. Everyone's a suspect when Detective Hercule Poirot arrives to interrogate all passengers and search for clues before the killer can strike again. The ensemble cast also includes Johnny Depp, Daisy Ridley, Michelle Pfeiffer, Penelope Cruz, Josh Gad, Willem Dafoe, Judi Dench, Lucy Boynton, Olivia Colman, Leslie Odom Jr., Manuel Garcia-Rulfo, Derek Jacobi and Marwan Kenzari. Rounding out the top 10 will likely be A Bad Moms Christmas ($9.2 million), Jigsaw ($3.9 million), Boo 2! a Madea Halloween ($2.8 million), Geostorm ($1.7 million), Happy Death Day ($1.4 million), Thank You for Your Service ($1.2 million) and Blade Runner 2049 ($1.1 million). Box Office Mojo reveals that, also opening in limited release this weekend is Gravitas Ventures' romantic comedy Amanda & Jack Go Glamping, Atlas Distribution's No Greater Love, Cohen Media Group's re-issue Shakespeare Wallah, The Orchard's thriller Thelma and Fox Searchlight's crime comedy Three Billboards Outside Ebbing, Missouri. It isn't clear if there are plans for any of these limited release titles to expand nationwide in the weeks ahead. Looking ahead to next weekend, Warner Bros. will roll out its highly-anticipated Justice League in theaters, which actually has some competition in wide release, with Lionsgate's drama Wonder and Sony's animated comedy The Star. While neither movie appears to give Justice League a huge run for its money, most Marvel movies like Thor: Ragnarok open with no other competition in theaters, so it will be interesting to see if this counter-programming strategy pays off for Wonder and The Star, or if they'll both tank against the superhero ensemble Justice League. Take a look at our top 10 projections below, and check back on Sunday for the top 10 estimates.